Craftsy provides education and tools to help you bring your creativity to life. Join cookbook author and food writer Marge Perry and transform boring chicken dishes into flavorful meals the whole family will love! Learn how to evenly pound and perfectly sear boneless chicken breasts as well as stuff and bake bone-in breasts for tender, juicy results. Master the three-part process behind buffalo wings that easily outdo any restaurant version, and discover the potential in affordable, versatile chicken thighs and drumsticks. Learn two ways to roast a whole chicken -- one that puts dinner on your table with only 10 minutes of prep time! Plus, quickly cut up or carve a whole chicken with Marge's expert tips. 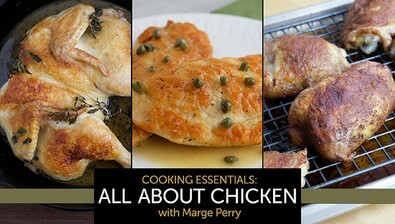 Join today and gain the skills to make any chicken recipe a savory success!